TORONTO, CANADA--(Marketwire - Feb. 8, 2012) - Seabridge Gold (TSX:SEA)(NYSE Amex:SA) announced today that a successful 2011 drill campaign at its 100%-owned KSM project has increased estimated measured and indicated gold resources by 3.7 million ounces and added another 0.5 million ounces in the inferred category. The updated, independent NI 43-101 compliant resource estimate, prepared by Resource Modeling Inc. ("RMI") of Stites, Idaho, will now be incorporated into a new Preliminary Feasibility Study ("PFS") on KSM scheduled for completion in April, 2012. To view the table titled "KSM Mineral Resources at 0.50 g/t Gold Equivalent Cutoff-Grade," please visit the following link: http://media3.marketwire.com/docs/SEA0802tables.png. Seabridge Gold President and CEO Rudi Fronk noted that the objective of the 2011 KSM drill program was to upgrade inferred resources contained within the Sulphurets, Kerr and Mitchell open pits defined in the 2011 PFS. "Successfully upgrading 3.7 million ounces of gold resources to measured and indicated means that proven and probable reserves are likely to climb from last year's estimate of 38.5 million ounces of gold and 10.0 billion pounds of copper when the updated PFS is completed this April. We also expect improved economics from the conversion of in pit inferred resources and unclassified material to measured and indicated, as these were previously modeled as waste." RMI's updated resource model incorporates 2011 drill results from the Sulphurets, Kerr and Mitchell deposits. Gold and copper grades were estimated using inverse distance weighting methods within geologically constrained gold and copper grade domains constructed for the Mitchell, Sulphurets, Kerr and Iron Cap zones. The grade models were validated visually and by comparisons with nearest neighbor models. The estimated block grades were classified into measured, indicated and inferred mineral resource categories based on mineralized continuity that was determined both visually and statistically (i.e. variogram ranges and gold equivalent indicator probability models) together with proximity to drilling data. To facilitate comparisons with previous resource estimates, recoverable gold equivalent grades were calculated using the same $650 gold price with a 70% gold recovery rate and a $2.00 copper price with an 85% copper recovery rate. 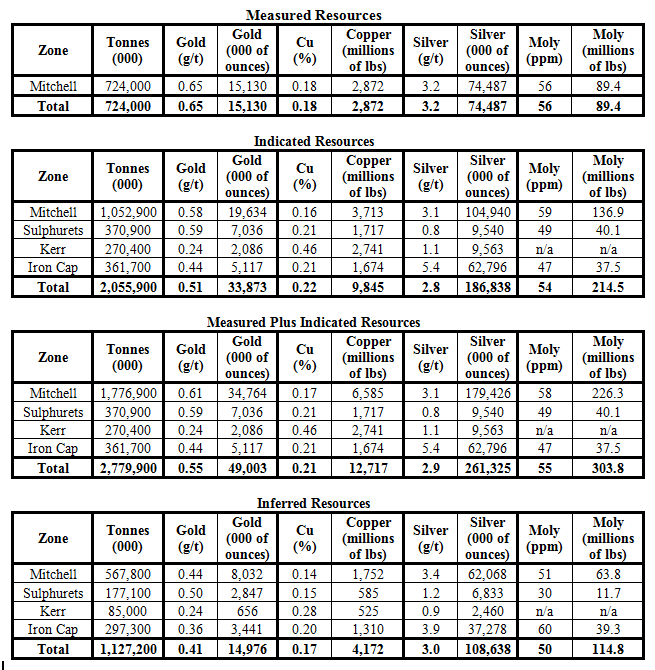 The cutoff grade for resource tabulation was set at 0.50 grams per tonne (g/t) gold equivalent, also consistent with the cutoff grade used for previous KSM resource estimates. "Unlike other companies that update mineral resource estimates using higher and higher metal prices, we have elected to consistently report our resources at the metal prices that were used when resources were first estimated. This practice enables us to report a true increase in mineral resources based on drilling results, not higher metal prices. One of our guiding principles is to grow our gold resources faster than our shares outstanding. Last year's drill programs increased measured and indicated gold resources by 3.7 million ounces at KSM and 1.2 million ounces at Courageous Lake while our shares outstanding only grew by approximately 2.4 million during the same period." said Mr. Fronk. The drill hole database that was used to estimate mineral resources for the KSM project now incorporates 508 diamond core holes totaling approximately 144,375 meters. Over 97% of the holes at Mitchell were drilled by Seabridge from 2006 through 2011. Approximately 87% of the total Iron Cap meterage was drilled by Seabridge in 2010. The majority of the Sulphurets assay data were collected by Seabridge (71%), Placer Dome (15%) and Falconbridge (5%). The remaining 9% of the Sulphurets drilling data were collected by Esso Minerals and Newhawk Gold. The majority of the drilling data for the Kerr zone were collected by Placer Dome during the early 1990s. Seabridge's 2010 and 2011 Kerr drilling campaigns now total about 17% of the Kerr drill hole data. RMI has reviewed the quality assurance/quality control ("QA/QC") protocols and results from Seabridge's 2006-2011 drilling programs and has deemed that the number and type of gold and copper standard reference materials (standards, blanks, and duplicates) were reasonable. Based on the performance of those standard reference materials, RMI believes that the Seabridge drill samples are reproducible and suitable for estimating mineral resources. RMI reviewed the Placer Dome QA/QC data for the Sulphurets and Kerr zones and found the data to be reliable. No Esso QA/QC data were available for review but RMI notes that the assay results from those holes compare favorably with nearby Seabridge drill holes. Based on QA/QC results and drill campaign comparisons, it is RMI's opinion that the assay data for the Kerr and Sulphurets zones are reliable for estimating resources. Gold resource estimates included herein were prepared by Resource Modeling Inc. under the supervision of Michael Lechner, who is independent of Seabridge and a Qualified Person as defined by National Instrument 43-101. Mr. Lechner is a highly regarded expert in his field and frequently undertakes independent resource estimates for major mining companies. Mr. Lechner has reviewed and approved this news release. Exploration activities at KSM are being conducted by Seabridge personnel under the supervision of William E. Threlkeld, Senior Vice President of Seabridge and a Qualified Person as defined by National Instrument 43-101. Mr. Threlkeld has reviewed and approved this news release. An ongoing and rigorous quality control/quality assurance protocol was employed during the 2011 program including blank and reference standards in every batch of assays. Cross-check analyses were conducted at a second external laboratory on 10% of the samples. Samples were assayed at Eco Tech Laboratory Ltd., Kamloops, B.C. and ALS Chemex, Vancouver, B.C., using fire assay atomic adsorption methods for gold and total digestion ICP methods for other elements. Seabridge holds a 100% interest in several North American gold projects. The Company's principal assets are the KSM property located near Stewart, British Columbia, Canada and the Courageous Lake gold project located in Canada's Northwest Territories. For a breakdown of Seabridge's mineral reserves and mineral resources by category please visit the Company's website at http://www.seabridgegold.net/resources.php. This document contains "forward-looking information" within the meaning of Canadian securities legislation and "forward-looking statements" within the meaning of the United States Private Securities Litigation Reform Act of 1995. This information and these statements, referred to herein as "forward-looking statements" are made as of the date of this document. Forward-looking statements relate to future events or future performance and reflect current estimates, predictions, expectations or beliefs regarding future events and include, but are not limited to, statements with respect to: (i) the amount of mineral reserves and mineral resources; (ii) any potential for the increase of mineral reserves and mineral resources, whether in existing zones or new zones; (iii) the amount of future production; (iv) further optimization of the PFS including metallurgical performance; (v) completion of and submission of an Environmental Impact Statement and permit applications; and (vi) potential for engineering improvements. Any statements that express or involve discussions with respect to predictions, expectations, beliefs, plans, projections, objectives, assumptions or future events or performance (often, but not always, using words or phrases such as "expects", "anticipates", "plans", "projects", "estimates", "envisages", "assumes", "intends", "strategy", "goals", "objectives" or variations thereof or stating that certain actions, events or results "may", "could", "would", "might" or "will" be taken, occur or be achieved, or the negative of any of these terms and similar expressions) are not statements of historical fact and may be forward-looking statements. All forward-looking statements are based on Seabridge's or its consultants' current beliefs as well as various assumptions made by them and information currently available to them. These assumptions include: (i) the presence of and continuity of metals at the Project at modeled grades; (ii) the capacities of various machinery and equipment; (iii) the availability of personnel, machinery and equipment at estimated prices; (iv) exchange rates; (v) metals sales prices; (vi) appropriate discount rates; (vii) tax rates and royalty rates applicable to the proposed mining operation; (viii) financing structure and costs; (ix) anticipated mining losses and dilution; (x) metallurgical performance; (xi) reasonable contingency requirements; (xii) success in realizing further optimizations and potential in exploration programs and proposed operations; (xiii) receipt of regulatory approvals on acceptable terms, including the necessary right of way for the proposed tunnels; and (xiv) the negotiation of satisfactory terms with impacted First Nations groups. Although management considers these assumptions to be reasonable based on information currently available to it, they may prove to be incorrect. Many forward-looking statements are made assuming the correctness of other forward looking statements, such as statements of net present value and internal rates of return, which are based on most of the other forward-looking statements and assumptions herein. The cost information is also prepared using current values, but the time for incurring the costs will be in the future and it is assumed costs will remain stable over the relevant period. By their very nature, forward-looking statements involve inherent risks and uncertainties, both general and specific, and risks exist that estimates, forecasts, projections and other forward-looking statements will not be achieved or that assumptions do not reflect future experience. We caution readers not to place undue reliance on these forward-looking statements as a number of important factors could cause the actual outcomes to differ materially from the beliefs, plans, objectives, expectations, anticipations, estimates assumptions and intentions expressed in such forward-looking statements. These risk factors may be generally stated as the risk that the assumptions and estimates expressed above do not occur, but specifically include, without limitation: risks relating to variations in the mineral content within the material identified as mineral reserves or mineral resources from that predicted; variations in rates of recovery and extraction; developments in world metals markets; risks relating to fluctuations in the Canadian dollar relative to the US dollar; increases in the estimated capital and operating costs or unanticipated costs; difficulties attracting the necessary work force; increases in financing costs or adverse changes to the terms of available financing, if any; tax rates or royalties being greater than assumed; changes in development or mining plans due to changes in logistical, technical or other factors; changes in project parameters as plans continue to be refined; risks relating to receipt of regulatory approvals or settlement of an agreement with impacted First Nations groups; the effects of competition in the markets in which Seabridge operates; operational and infrastructure risks and the additional risks described in Seabridge's Annual Information Form filed with SEDAR in Canada (available at www.sedar.com) for the year ended December 31, 2010 and in the Corporation's Annual Report Form 40-F filed with the U.S. Securities and Exchange Commission on EDGAR (available at www.sec.gov/edgar.shtml). Seabridge cautions that the foregoing list of factors that may affect future results is not exhaustive.